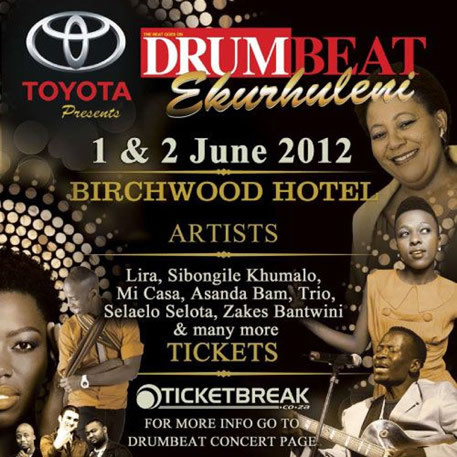 Toyota presents DRUM Beat Ekurhuleni in association with Hilltop Live Productions, Amstel Lager and Media24 on Friday 1 and Saturday 2 June 2012 at Birchwood Hotel & Conference Centre. The inaugural DRUM Beat concert held at Mofolo Park, Soweto, in April 2011 was a family-friendly music spectacle. This year the festival moves to Birchwood Hotel and Conference Centre in the City of Ekurhuleni and will be a bigger and more exciting musical experience. DRUM Beat Ekurhuleni, presented over two days, will showcase prominent cross-genre artists on the main stage, jazz stage and piano lounge. The programme will be predominately jazz-oriented with a twist of Afro-pop and dance music. The Friday event gates open at 17:00 and artists confirmed for this evening are: Maleh / Trio (Steve Kekana, Babsy Mlangeni, Joe Nina) / Herbie Tsoaeli and Zahara. Saturday’s gates open at 12:00 midday and the event runs until 02:00. Artists confirmed for Saturday include: Lira / Adam Glasser / Zakes Bantwini / Stimela / Sibongile Khumalo / Selaelo Selota / Karen Zoid & Vusi Mahlasela / Hot Water / Kold Produkt / Toya DeLazy/ Asanda Bam and Mi Casa. 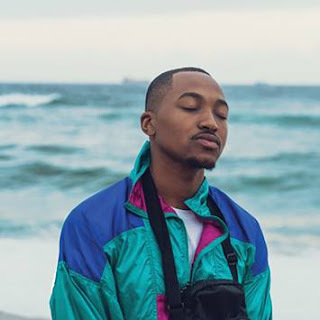 Tickets: cost R400 for the Friday (one stage), which includes cocktail snacks and drinks to the value of R150. Saturday tickets cost R250 (three stages) for entry only and all tickets are available at Ticket break. 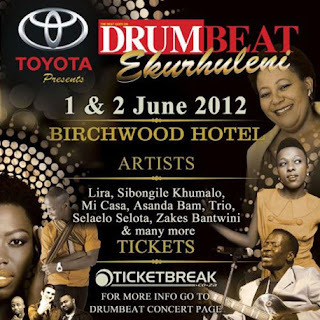 DRUMBEAT is presented by Toyota in association with Hilltop Live Productions and Amstel Lager. This Event is Only Open to Persons over the Age of 18 years. Drink Responsibly.